Qt Creator 1.3 comes with preliminary support for development of applications using Qt for the Symbian Platform. Note that this is highly experimental, and not intended for production use. The primary aim is to allow Symbian developers to familiarize themselves with Qt Creator and provide feedback that will help us improve Symbian support in future versions of Qt Creator. Please provide us with feedback, using the mailing list or IRC, as described on the Qt Creator Development Wiki. You need the following software installed on your PC. Only Windows development is supported. Open C/C++ v1.6.0 or higher. Install this to all S60 SDKs you plan to use Qt with. This is included in the Qt for Symbian binary installers. Either the GCCE Arm Toolchain that is included in the S60 Platform SDKs, or RVCT 2.2 [build 686] or later (which is not available free of charge). Your environment needs to find the compiler in the PATH. Qt for Symbian 4.6.0, installed into the S60 SDKs you want to use. The Nokia USB drivers that come e.g. with PC Suite. The App TRK application for your device. If you want to run your applications in the Symbian Emulator, you also need to install Carbide.c++ v2.0.0 or higher. 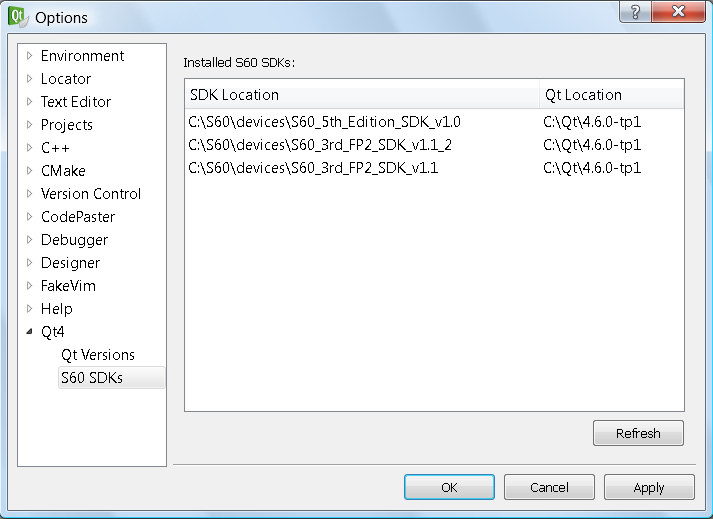 When you run Qt Creator after installing the S60 Platform SDK and Qt for Symbian, the installed SDKs and their corresponding Qt versions are automatically detected. For each detected S60 SDK with Qt, a special entry is made in the Qt Version Management settings Tools -> Options... -> Qt4 -> Qt Versions. Note that if you manually add a Qt version for Symbian, you must also manually specify the S60 SDK to use for this version. If you want to run your applications in the Symbian Emulator, you need to point Qt Creator to the Metrowerks Compiler that you want to use, by setting the Carbide Directory of the Qt version to the corresponding Carbide.c++ installation directory. You can check what S60 SDKs and corresponding Qt versions are found in the Tools -> Options... -> Qt4 -> S60 SDKs preference page. After installing all the prerequisites and checking the setup in Qt Creator as described above, you need to make some settings for your project. Note that the only supported build system for Qt for Symbian applications in Qt Creator is qmake. Before you can build your project for the Symbian Platform you need to create build configurations for it. Open Projects mode and make sure that your project is selected for editing in Edit Project Settings for Project .... Add debug and release build configurations for the Symbian target by selecting the corresponding Qt version from the build configuration Add menu. The created build configurations default to using the GCCE tool chain. If you want to build for the device using RVCT, or for the Symbian Emulator using WINSCW, change the tool chain in the General section of the build configuration settings (press the Show Details button first). Now you can switch to building your project for the device by selecting one of the new build configurations as the active configuration at the top of Projects mode. Similar to the build configuration setup for your project you need to create a run configuration for running your project in the Symbian emulator: Switch to Projects mode and in Run Settings you will find the Add -> YourApplication in Symbian Emulator button. To start your project in the emulator select this run configuration as the active configuration at the top of Projects mode and press the run button. To run your project on a real Symbian device, just add another run configuration in Projects mode via Run Settings, Add -> YourApplication on Symbian Device button. In the details of the run configuration you can specify a certificate to use, and select one of the devices that you have currently attached to your computer. The only connection mode supported at the moment is USB in PC Suite mode. For actually running your application on the device, you need to set the device run configuration as the active configuration at the top of Projects mode. Start the App TRK application on your device and press the run button to create a package for your application, deploy, install and run it automatically on your device. Did you build your application with a Qt version for Symbian? Are the settings for the Qt version you use to build your project correct? Check the path to the S60 SDK, and if you need to specify the path to your compiler tool chain. Is the emulator/device run configuration selected as the active run configuration? Did you build using the right toolchain, i. e. WINSCW for running in the Emulator, GCCE or RVCT for running on the device? If the emulator process could not be started, try closing Creator and starting the application directly from your file manager. Having done this, Creator should be able to run your projects in the Emulator. Is the device connected via USB in PC Suite mode? Is App TRK running on the device, using the USB connection, and does it have status connected? Is your device detected and selected in the run configuration details? If neither of this helps to solve your problem, search the qt-creator@trolltech.com mailinglist archives or provide feedback to us via the methods described on the Qt Creator Development Wiki.